Last week a co-worker's husband called work and when I answered the phone he started raving about the muffins his wife had made the night before. He told me they were the best muffins she had ever made, which is saying a lot because she is a fabulous cook. Later in the day I asked her for the recipe and she quickly printed it for me. Let's me just say, that these are definitely the best muffins I have ever made. They have a light, cake like texture that isn't too sweet. The best part about them is the wonderful blueberry swirl that combines with the whole berries. And let's not forget the lemon sugar topping or the streusel topping, I made both because I couldn't decide which would be better--both are equally wonderful on top of these muffins. Inadvertently, bought the wrong size container of blueberries at my store, so I didn't have as many as the recipe calls for, but it didn't matter they were still FABULOUS! I plan on making more of them very soon with the variety of fresh and frozen fruits I have on had. Enjoy! Edited 12/24/11--Add your butter gradually if you decide to do the streusel topping. More or less may be needed depending on the humidity in your area to create a nice crumbly topping. If you find it is too soft add more flour to achieve the consistency you need. If topping with lemon sugar, stir together sugar and lemon zest in small bowl until combined; set aside. If topping the muffins with streusel, combine ingredients until it is the size of peas and set aside. Beautiful color in these. They look delicious. My husband absolutely loves blueberry muffins. These are on my list to make! What a good husband to rave about his wifes cooking! I am pretty sure my husband hasn't done that - he! he! I want to eat the tops off of these muffins! can you freeze these? they look great!!! Tried these out the other day and they were a big hit!!! Thanks so much for sharing. Found you on Pinterest!! Are you sure that the streusel topping doesn't call for softened butter instead of melted?? I made these and usually a topping like that calls for softened butter so you can crumble it on top. Next time I will try it that way. Also be careful not to mix the tsp of berry mixture on top too much, it will cause your muffins not to rise as well. Just sharing my experience with you. That being said, these were the best blueberry muffins I've ever had. Hubby loved them as well. Thanks for this recipe!! Chrissy the topping is made with melted butter. I have made many variations with softened and even cold butter like you asked about. I'm glad you enjoyed them, they are my family's favorite too! I made te streusel topping with melted butter and couldn't get it crumbled, just a paste. Any suggestions on where I went wrong? I was wondering if you can use frozen blueberries rather than fresh?? Heather you can definitely use frozen blueberries! When I use them, I take them out of the freezer RIGHT before I'm going to stir them into the batter so they are still frozen and don't release their juices. I also try to place them into a colander with a few tablespoons of flour. Toss to lightly to coat them and then gently blend into the batter. I hope you like them! ahhh Im in the middle of making these.. I got powder buttermilk but as Im reading instructions Im not sure if these are calling for liquid buttermilk or the powder.. need help STAT! Meagan I'm sorry I didn't see this sooner! I always use regular buttermilk from the dairy section of my grocery store. I am sure powdered would work fine as long as it is mixed according to the directions on the packaging. I hope they turned out for you! I'm having trouble with the streusel topping.....it seems when I add the full 5T of melted butter it makes a thick paste vs. the crumb like streusel topping. What am I doing wrong? Hi lauren_OT22...sorry to hear your topping is giving you trouble! The easiest way to fix this is to add more flour into your mixture. Depending on the humidity in your area you may need more or less flour. Next time you can start with less butter and work it in gradually too. I hope it works for you! Can I use salted butter?? How much lemon juice do I add to the milk to make buttermilk? mistinchad-Salted butter is fine. When I am out of buttermilk, I use 2 T lemon juice and enough regular milk to make 1 cup. Let it sit for about five minutes and then it is ready to go. Anonymous--I usually get 12-15 muffins depending on how much I fill the cups and using a standard sized muffin tin. I used quality blueberry jam (to save time) instead of the blueberry mixture and frozen berries and they tasted really delicious. Been mening to try this recipe for a while and finally got round to it. They were a huge hit. Petra-What a great idea using jam instead of the cooked blueberry mixture. I will have to try that sometime! Great recipe except that the bottoms of mine were burned before the middle was even cooked...and I only put them in for 14 min. I used a dark nonstick pan. Next time I will use better judgement and reduce the temp like my instinct was telling me. 375 is a much more reasonable temp. The taste is good enough to warrant another try with different cooking temp. Alisha-I'm sorry to hear your muffins didn't turn out as well as mine always do. I bake my muffins in stoneware muffin pans, but my friend uses an aluminum pan with great results. Ovens definitely vary, I have thinking of investing in a thermometer to see how accurate mine is. I hope your next batch turns out perfectly! Absolutely delicious!!! Baked these tonight and gave some to neighbors to share their goodness :) 375 for 18 minutes worked perfectly, by the way.. Thank you !! Oh my!! These muffins are absolutely gorgeous! These are definitely the best blueberry muffins I have ever made. I did make a couple of changes. I simply put the 2 cups of blueberries into the batter and I did dust them first with flour so they don't bleed into the batter. I also added lemon zest to the streusel topping. These will definitely be a hit in my home! The muffins turned out wonderfully!! They were AMAZING!! Best blueberry muffins i've ever had!! They didn't last long today:) I will be making these again....if only i had more blueberries i'd be making them now!! Jennifer these don't last long at my house either. I have started making double batches just to make them last longer than one day. They were good but it was definitely too high of a temperature and too long in oven. Bottoms of all of them were burnt to a crisp and they were only in for about 13 min. I will be trying the 375 for about 15 minutes next time. Is there an easier way to prinT this recipe without all the pictures and whatnot????? Mikki, I added a printable link to the post. I just made this recipe and at the moment (yes at 11:30 at night) I have a warm muffin sitting next to me. They are delish though....despite the minor mistake. It my tiredness and wanting to get them done quickly I skipped a line in the recipe (the one about adding the blueberry mix to the cups and swirl)....I added it all to the batter instead (opps)...The muffins are good but next time I will read the recipe more carefully! Thanks for sharing! Linda I will have to try your variation, I love making crumb cakes. Thanks for sharing! I made these late last night. My favorite muffins are blueberry! The recipe looked so good. I just made a little change. I added half the blueberries to the batter but crushed them because my youngest doesn't like the chunks of berries. These were a big hit in my home! The boys call them purple berry muffins because they are very purple since the berries are crushed into the batter. We used the berries from our summer picking last year in the forest here in Norway. I think the berries are a lot smaller than the ones you shop at the grocery store. Kristina thanks for stopping by my part of the world! I'm glad your family liked the "purple berry muffins!" I'm making these now! Although sometimes I'm so excited about making something I don't follow directions and that happened with this one. I mixed it all up together (minus the topping) and totally skipped all the other yumminess in my haste. I'm betting they will still turn out but I'm keeping this one to follow next time! I just made these :) They were pretty good! However, it took nowhere near the 5 tbsp of butter for the streusel topping... I added only 2 tbsp and it was still too much. Also, I love the way the muffin top goes over the edge of the liner in the picture... to get that effect do you just have to fill each one with more batter? I'm glad you liked them. The amount of butter can vary widely depending on the humidity in the area you live. It is very dry where I'm at. Sometimes I have to increase the liquid in my baking to achieve the correct texture. To get the overhang you fill the muffin pan a little higher than normal. It creates a very tasty muffin top. Just wanted you to know I made your muffins for the Crazy Cooking Challenge this month, they were wonderful!!! Thanks for sharing the recipe with the rest of us. These muffins look insanely delicious... I think I'm in love here. I just made these and they actually are the best blueberry muffins I've ever had. They literally turned out picture perfect. Thanks! Jacqueline I'm so glad they turned out so wonderfully for you! So excited to make these for a friend's baby shower brunch this weekend. Can I make them the night before and will they still look as fab as yours do?? Thanks for the fun recipe and help!! They store very well! I have even made them and put them in the freezer with wonderful results. I am looking to "mimic" our store bakery Chocolate Chip muffins.. Would this work with chocolate chips in place of blueberries? My 8 year old daughter loves the CC Muffins from our grocery store, but they are pretty pricy at $3.99 for 4 and they are gone in two days... She is finicky too, so maybe I could try this... Thanks! Jam1969 I think you could use chocolate chips easily in this recipe. I have thought about adding cocoa to them and doing a double chocolate muffin, but I haven't had the time to try it. Let me know how your attempts work! Just got done eating the first one- and they are great! I tried one with the streusel topping, but I also made a few with the lemon sugar. (and I made two with both toppings, haha) Thanks for sharing! streusel melted into the muffin batter, causing it not to rise and become too wet in the middle, so now I have a giant mess in my oven and undercooked muffins... I dumped everything into a cake pan and I'm gonna pour cake batter over it and bake to try to save this apparent waste of an effort. Anonymous I am sorry these didn't turn out for you. I haven't seen or heard of the streusel doing this to anyone else. How thick was your batter? Mine is typically very thick and not runny I wonder if that was the cause? Also, climate changes may have affected yours. More humid climates don't have the same results as those in very dry climates like mine. I hope the cake effort results in something good to eat! Can you add BOTH toppings to the muffins?! They both sound so delicious, it's hard to choose which one you'd want! Jessica, I am sure you could use both. I think others have commented that they did. I haven't because not everyone in my family enjoys the lemon. Made these over the weekend, they were phenomenal! Used fresh locally grown blueberries and I did just as you suggested and added the butter to the streusal mix slowly and it ended up being a great tip because I only needed about 4 tbsp. Thanks for the awesome recipe! These are in the oven right now...can't wait to try them. 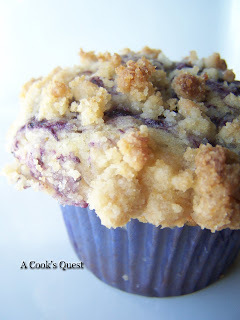 My husband and I love your recipe for these amazing blueberry muffins...I found a different recipe using blueberries and asked my husband if he wanted me to make that recipe. His only response was "But, what about those mufffins?!?!?! I love those muffins!" Only recipe we will use in this house!! Thanks! These muffins really are great! Mine turned out a little too dry, but the taste and flavor was still great. Next time I will cook them at 375, hopefully they will be less crumbly!! Thanks for sharing!! Oh my gosh. I just made these and they are so delicious. Thanks for such a great recipe! I will definately have to try this recipe out. I also have a really good recipe for blueberry muffins. Check out my blog - sewyourhooutout.blogspot.com - I think I will be posting it within the next few weeks. These do look delicious though! If anyone tried it with chocolate chip, please let us know how it worked out! I'm trying the blueberry this weekend! I just made these and they are DIVINE! Thank you so much for sharing this wonderful recipe! Oh my, made these this morning for breakfast! Husband and four kids devoured them! Thank you for sharing. Just taking these beauties out of the oven! Gorgeous! I wondered if you have a good sound technique for removing muffins from the tin while keeping them intact. I find that is especially difficult when they have this beautiful top that comes up and over the edges. They usually fall apart for me. Any ideas? A knife seems to cut right through them. Also wondered if you have a good way of keeping muffins from getting a soft top from moisture when storing. Thanks for the great recipe! As for storage, one batch is gone in a day at my house. If you plan on eating them within 24 hours, I wouldn't seal the bag that you put them in. These muffins look fantastic. I have worked in a bakery for 25 years and owned one for the last 10 and recently closed up shop, but I wish I would have seen this recipe before, they definitely would have been a part of the "goods". I made a few changes, I added the zest to the streusel and in the bakery I had something called connections sugar which is a more coarse sugar. I used the streusel topping and then just the connections sugar. Minor changes but I'm sure it will work. 15 more minutes in the oven and I'm pretty sure I'll be eating one of the best muffins ever. Thanks for sharing. Brian, thank you for the wonderful comment. I have definitely noticed the cooking times vary. Can you tell me where to find connections sugar? I would love to try that! My muffins were moist right out of the oven but became pretty dense the next day after they cooled. Do you know which step might be causing this? I have never had the muffins last longer than a day. I have a few thoughts, though. 1. They may not have been fully cooked in the middle. When batter isn't fully baked, it takes on a heavy texture. 2. Were they stored away when they were still warm? If stored in airtight containers before fully cooling, moisture will settle into the muffins which can cause a heavy dense texture. Made these tonight and they were AMAZING! 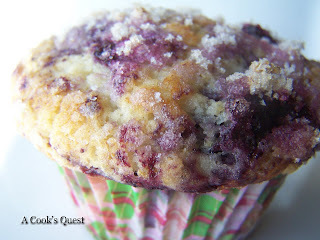 Definitely best blueberry muffin recipe! My husband (who isn't into sweet stuff) downed 2 of them right away saying they were amazing! Thanks for sharing this great recipe! These look delicious! I want to make these but I do not have buttermilk or lemon on hand. Can I use Almond milk or regular milk instead? Darci, I apologize it took me a few days to respond. I was out of town and away from a computer. The buttermilk is important because it reacts with the baking powder, which helps to create a lighter and fluffier final product. Adding an acid to milk in the form of lemon juice or vinegar will help make this happen. If you use regular milk you may end up with a denser final product. In regards to the almond milk, I have no experience cooking with it so I'm not sure how it would affect the final product. Hi there! I am planning to bake these tonight. I live in Denver (high altitude) - have you heard of any changes I may need to make for high altitude baking? Thanks! Hi Brooke, I haven't heard of any adjustments for high altitude baking with this recipe. Let me know how they turn out. These look great! having trouble deciding- sugar topping or streusel? maybe i'll do half and half-- i need opinions, which is your favorite? Jacqueline, I choose by what is in my pantry. If possible, I do both toppings and then eat two muffins lol. My family prefers the lemon sugar topping, and it is the easiest of the two. He/She cut the sugar down to 1 cup to reduce calories. They didn't see the need for the syrup with the amount of blueberries, and cooked for 15 mins on 425 until they thought the bottoms were burning slightly. In addition, he or she stated that when using frozen blueberries, rinsing and drying them helps to prevent the batter from changing to a strange blue/gray color. I hope I remembered most of it. Made these today, they look great and are cooling now. I made these exactly as called for in the recipe except I forgot to add the vanilla extract I'm hoping the flavor won't be affected too much! I am having one of these with a cup of tea for my lunch....breakfast, lunch it all goes to the same place right?! It is fluffy and moist! Thanks for sharingvthis great recipe! Oh, and, my streusel topping did melt into the top for the most part, but it could have been a bit too wet to begin with. For the streusel topping adding the butter little by little is the way to go. I mixed all the ingredients together and it turned into a paste. I only needed 3 Tablespoons! I forgot to put salt in the flour!!!! It makes a huge difference in the way the muffins taste I can't believe I forgot the salt and I had it right next to me! They came out excellent looking...but you can definitely taste that there is no salt. I never knew how much it mattered till now. Great recipe anyways thank you. I will definitely try again another time thank you. I made these a few weeks ago and they were great. I decreased the temp to 375 as I felt 425 was far too high for a muffin. They came out just fine! Has anyone tried this recipe in mini loaf pans? I really enjoyed the flavor of these, but mine were very dense. Perhaps over-mixing? Heather, I'm sorry yours were dense, that is too bad! A couple of possibilities, over mixing like you suggested, old baking powder, or not letting the eggs get super thick before combining with the other ingredients. I would lean towards the over mixing or baking powder. I hope they are better next time for you. Lady, these are amazing. I questioned the struesel @ first but it's the best ever! my Valentine's are very happy:) Thank You! I have two questions. First do you think I could use smart balance vegetable instead of butter? Or applesauce instead of butter? Also, what about half white flour and half whole wheat flour? Would that make it too dense? Anonymous, smart balance may be a good option instead of butter; however, I wouldn't use the applesauce. I think the applesauce could cause them to be heavy. Just took these out of the oven and they look beautiful! Just like the kind of muffins from restaurants that are 4.00 bucks a pop! Thank you!! When you make the blueberry swirl, how much water are you supposed to use? These are absolutely wonderful! The streusel topping is awesome - next time I'll try it with the lemon topping. I have a feeling that will be great as well! If I were to make these in mini form - what time/temp would I use? Thanks! For mini muffins, you could reduce your heat to 375, and I would guesstimate a cook time of 10-15 minutes. This depends HIGHLY on your oven, so definitely keep an eye on your first batch. Good luck! Could you use stevia in place of sugar? Has anyone tried this? Hi, i have allergies to all dairy and can use 'vitalite' for the butter but what can i omit the buttermilk with? could i maybe use soya yogurt? I'm sorry, I don't have any experience with dairy substitutions. This may be a question best answered by someone at your local health food store, or a dietician. Just made these, they are wonderful! And I only had 1/2 cup of buttermilk so I used my Almond milk to make it one cup... so maybe almond milk as a substitute for biddyhart. Defiantly the best blueberry muffins I have ever had! They worked out perfectly even though I had many mistakes. I can almost say this recipe is fool-proof! Loved them, they were gone in 2 days tops! Thanks for sharing such a wonderful recipe! Very yummy! I made this as a coffee cake instead of muffins, takes a bit longer to bake, but well worth the few extra moments. I didn't have eggs on hand but read on another blog that you could substitute yogurt for eggs. Trying it out now. I'll try to update everyone on how it went when they are out of the oven! Does anyone know how many muffins this recipe makes? It will make 12-14 depending on the size of muffin tin and amount of batter you use. These muffins were very good! I made them with the streusel topping and thought it gave them a special sweetness and texture that was great. Next time, though, I think I'd rather try the lemon sugar topping to give them a little more of a zingg! I found your recipe on Pinterest. They are the best muffins ever!!!!!! I shared with my fan on my facebook page...I'm sure they will all love them too! Making a second batch today! The best blueberry muffin recipe by far!!!! thank you for sharing! The muffins are great! One problem with the recipe though, I followed the recipe for the streusel and it was soupy!!!! I had to add to a lot more sugar to it to get it the right texture. For those of you doing the streusel, maybe just melt 3 tbsp. of butter and add slowly until it forms the small balls (about the size of peas). Happy baking! Thanks for your tip, I have definitely found that many things influence the final outcome of the streusel primarily the type of butter and the humidity in the air. This was so delicious there are no words! Just made these for my daughter's teacher for Teacher Appreciate Week and wow. They are so good! I'm not sure if my question was already published so I apologize if I'm repeating myself. I would like to make these for guests I'm hosting next week. If I make them now and freeze them, do you think they will freeze well? Any experience with freezing these? Tips or warnings? This is really a personal call...mine always turns out fine. But, as it states in the notes how the topping turns out depends a lot on the area you live in. 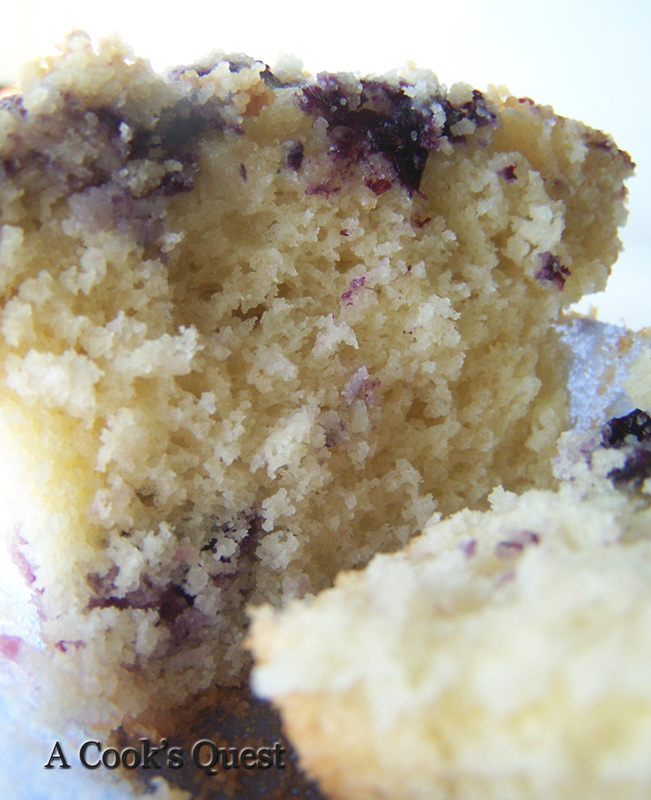 These really are the best blueberry muffins--moist, nice crumb, and beautiful top. I've searched for years for a great muffin recipe, and now I finally have one. Thank you! Maybe you should make a note in the recipe to start with less butter. I started by following the recipe and got a paste like others are mentioning. When I tried your method of adding more flour it only made a thicker paste...no delicious crumbles. Made these tonight, and of course I wasn't disappointed. I look at the pictures, the ingredients and read the comments. Comments is what caught my eye, word of mouth, ya know? The streusel is just like a recipe that you put on an Apple Pie, don't melt it, put in cold and use your fingers and add more flour if needed. I have one streusel recipe I use all the time. This was good but it didn't mix well. I also didn't have enough blueberries, I ate a lot yesterday so I just did the mix and swirled it in the muffin. The sugar and lemon rind is also what I love about it. Making the mix lumpy was the key, never over mix, perfect consistency. Kudos and thank you for another keeper. My 33 year old ate 4 right out of the oven. First time I've ever made blueberry muffins from scratch and they turned out delish!! My husband loves them! Will be making these again for sure. Already have people asking for the recipe just from seeing my picture of the final product on FB! I'm glad you liked them so much! My family devours them every time I make them.